Cosmos ‘Fizzy Rose Picotee’. New For 2017. Cosmos ‘Fizzy Rose Picotee’ is a rather flouncy number. Semi double flowers of a pale pink are edged with a deep rose. 2017 will be my first year of both growing them and also of having them in the shop. I strongly suspect they will make a dashing bridge between the simple sophistication of Cosmos ‘Purity’ and the bold and bright ‘Sensation’. 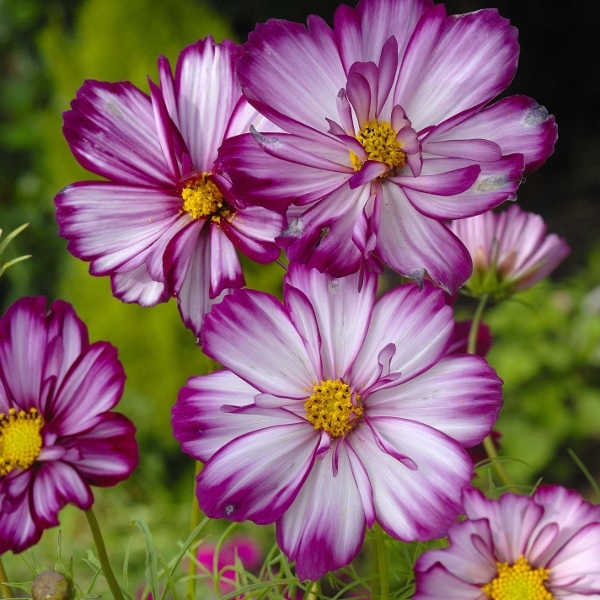 Cosmos are right up there in the top plants to have in your cutting patch, especially to people new to the sport. They are easy to grow, reliable, and produce heaps of blooms.